Wonga Pigeons are large birds (36-38 cm) which live in various types of woodland and are rather shy. They can be heard from a distance with their reptitive 'ooo, ooo, ooo, ooo,' call that can go on for a long time. 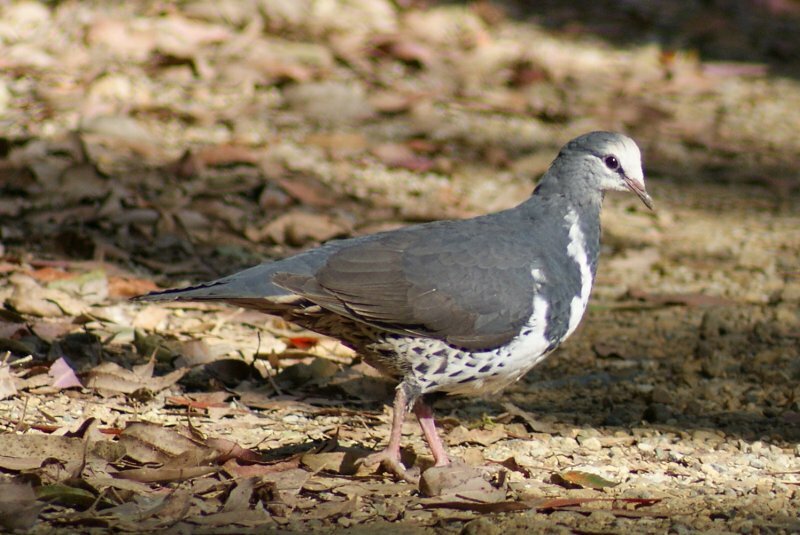 They have a distictive grey and white plumage with a V-shaped band on the breast and spots on the flanks. They occur from Southern Queensland through to western Victoria, but used to cover a larger range before they were persecuted by crop farmers and predated by introduced animals, such as foxes. 1: Gloucester Tops, NSW, 27/11/2010.